Posted by Jace Stolfo on Thursday, August 4th, 2011 at 10:32am. 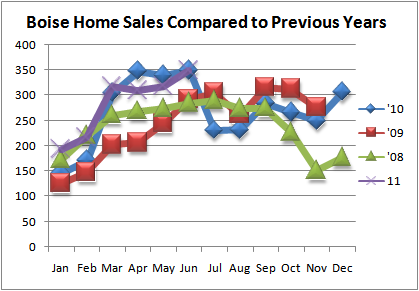 The number of homes selling in Boise Idaho in 2011 has been about even with last year. Although, I anticipate the next few months to to surpass 2010 levels. 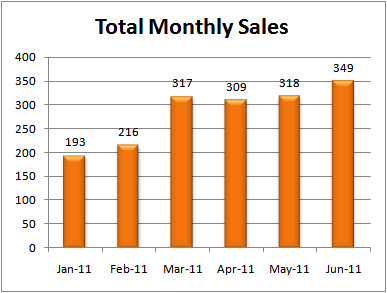 As you can see in the graph below, 2010 sales dropped substantially in July as the tax credit ended. 2011 has not had that type of external factor propping up sales, so real estate activity will likely remain strong in July and then begin to taper down in August.